In the last decade or so the collection of military items has increased. Perhaps this is due to the 50th and 60th Anniversary of World War II, the 100th Anniversary of World War I, the 200th Anniversary of the War of 1812, et cetera, or possibly, because of popular movies such as Saving Private Ryan or TV programs such as Band of Brothers. This exhibit will explore the reasons why some collectors collect what they do and what they have learned about history while doing so. Learn their stories and study their approach to history. Two museums housing exhibits, and other historic structures tell the story of life at Jefferson Barracks. Museums offer Free Admission and are open 12:00 - 4:00 pm, Wednesday through Sunday from February to mid-December. 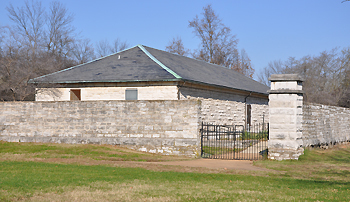 The Powder Magazine Museum (left), built in 1857, houses a permanent exhibit of the history of Jefferson Barracks from 1826 to 1946. Admission is free however donations are always appreciated. See more about the structure below. The Old Ordnance Room (right), built in 1851, houses temporary exhibits on military themes. Admission is free however donations are always appreciated. Guided tours may be booked in advance by calling (314) 544-6224. See more about the structure below. All the historic structures in the park are owned by St. Louis County Parks. The two museums, visitor center, Laborer’s House, Garden and Barn are staffed by Friends of Jefferson Barracks Volunteers. For more information about volunteering in St. Louis County Parks call Sue Bell at (314)-615-8865 or visit the St. Louis County Parks Volunteer Page and complete an application online. 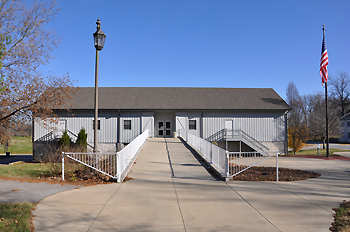 The building which today houses the Visitors Center for Jefferson Barracks County Park was built in 1878 as a two-level barn for the animals and wagons used by the artillery department. The lower level was made of limestone and the upper level was wood. After World War I, the building was used to repair tanks and a stone ramp was built on the west side of the barn in 1925 to access the second floor. Later, during the Great Depression, the building became a storage facility for the Works Progress Administration. During World War II, it was used as a reception center where families could meet their loved ones who were stationed at Jefferson Barracks. Jefferson Barracks was de-activated in 1946. Beginning around 1950, the federal government conveyed tracts of land to St. Louis County to operate as an historical park. It was about this time that the upper level was removed. In 1971 Jefferson Barracks County Park, the adjacent active military base, and several other adjoining land parcels were placed on the National Register of Historic Places. The Friends of Jefferson Barracks, a volunteer support group for Jefferson Barracks County Park, was organized in1983. The Friends operate a gift shop in the Visitors Center and sponsor events to raise money for the park. Through the efforts of the Friends the upper level of the Visitors Center was restored in 2003 and it now serves as an education center and community facility. Laborers House, Summer Kitchen, Garden, and Stable the Laborers House was constructed in 1851 to house the civilian laborers who constructed the buildings in the Ordnance section of Jefferson Barracks. Later it housed the ordnance keeper and his family. At different times a porch or balcony has been a part of the building. The summer kitchen can be seen to the west of the Laborers House. In the days before air-conditioning, a summer kitchen was used in order to remove the heat of cooking from the main house during hot weather. By the late 1900s the summer kitchen was eliminated. A typical garden of the 1850s might have included herbs and flowers that were essential not only to flavor food, but also used for medicinal applications such as treating fevers to settling upset stomachs. Herbs were also put to use as cosmetics, dyes, cleaners, insect repellants, air fresheners and sachets. 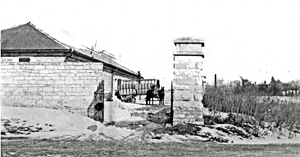 The Stable was built in 1851 to house four horses and two wagons that were used to haul munitions from the St. Louis Arsenal to the ordnance magazines at Jefferson Barracks. The architectural feature of having two doors, so that a wagon could be driven through the stable, is unique. The Visitors Center, Laborers House, and Stable were built of limestone from a quarry just east of here by the Mississippi River. 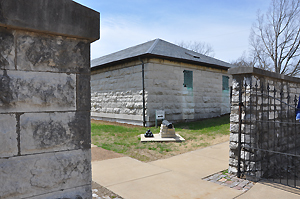 The Old Ordnance Room was the first of two limestone buildings built in Jefferson Barracks for the purpose of storing gunpowder. It was constructed in 1851 by Master Builder Francis Quinette of St. Louis. The cost, just over $18,000, included the stone wall around the building. Some said that Quinette could not erect a quality building for that amount, but the building remains in use. To the south of the museum building, but inside the compound, is a marker designating the area as a Blue Star Memorial By-Way. The marker was presented to St. Louis County Parks by the Mehlville Garden Club on September 12, 2004. The blue star symbol is taken from the World War II service flags that were displayed in thousands of homes during the war. The designation of a Blue Star Memorial By-Way is intended for parks and historical grounds, to commemorate soldiers who served overseas. This is one of the two remaining limestone powder magazines. This structure, which today houses the Powder Magazine Museum, was constructed in 1857. The walls are 4-foot thick limestone with arched ceiling and a wooden floor. If gunpowder exploded, it would take the path of least resistance, blowing through the wooden floor with the concussion causing each arch to fall, smothering the fire. The walls and roof would remain intact, so for all intent and purposes the building would remain useable. Images courtesy of St. Louis County Parks and Lorenz. All rights reserved. For permission to use an image, please contact Mike Venso, curator, Jefferson Barracks Park, 314-615-8882.